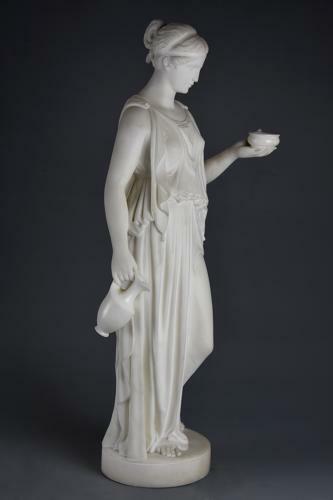 This sculpture depicts the fresh faced Hebe, who was said to have the gift of eternal youth, dressed in Classical draped chiton with cup in one hand and pitcher in the other, her hair of chignon style secured with ribbon, all supported on circular integral base. Hebe, the Greek goddess of Youth was the daughter of Zeus and Hera, she was a cupbearer for the gods and goddesses of Mount Olympus serving them with drinks of immortality. Bertel Thorvaldsen created two versions of the original life-size sculpture, the first in around 1806 and the second in around 1816, the second almost identical other than the design of the chiton: various plaster and marble versions of this sculpture are held in The Thorvaldsen Museum in Copenhagen, Denmark as well as many other sculptures and drawings by Thorvaldsen. Bertel Thorvaldsen (1770-1844) was a Danish sculptor who spent most of his life in Italy after being in The Royal Danish Academy of Art from the age of 11 and being awarded a ‘stipend’ (expenses) to travel to Italy to broaden his education, he remained in Rome for many years having set up a large workshop and working in a Neo-classical style - he was said to have been considered as the successor to the Master sculptor, Antonio Canova. This sculpture is in excellent condition, is of stable construction and can go straight into a home or collection.